DJ Cyn will be spinning at Ollieâs Pub & Grub in Frisco for the bar and restaurantâs Halloween party. Cynthia Mardones, aka DJ Cyn, is a freestyle DJ, meaning she plays to the vibe of the crowd. She takes extreme pride in being recognized for her skill level and how well she entertains, reads a crowd and sets a mood. The party starts at 10 p.m., with drink specials, a costume contest and other prizes. Call (970) 668-0744 or visit www.olliespub.com for more information. DJ Cyn will be spinning at Ollie’s Pub & Grub in Frisco for the bar and restaurant’s Halloween party. 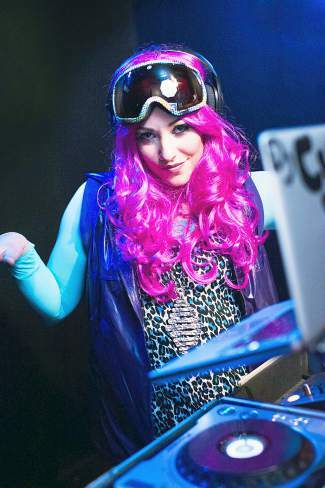 Cynthia Mardones, aka DJ Cyn, is a freestyle DJ, meaning she plays to the vibe of the crowd. She takes extreme pride in being recognized for her skill level and how well she entertains, reads a crowd and sets a mood. The party starts at 10 p.m., with drink specials, a costume contest and other prizes. Call (970) 668-0744 or visit http://www.olliespub.com for more information. The MotherLoaded Tavern in Breckenridge will host Stoney Live on Friday, Oct. 31, and Saturday, Nov. 1. From Stillwater, Oklahoma, Justin Stone rocks red-dirt music like no other. Covering everything from country music to solid rock hits of the ’80s and ’90s, Stoney Live brings people to their feet and causes spontaneous dancing on the tables. The music starts at 10 p.m. both nights, and there’s no cover. For more information, call (970) 453-2572 or visit http://www.motherloadedtavern.com. The Snake River Saloon will host Funky Johnson for its annual Halloween party on Friday, Oct. 31. From the metropolis of Summit County comes a funk outfit with tasty vocals, virtuosic guitar grooves, solid bass and tight drum beats. The band plays originals and covers ranging from Stevie Wonder and Earth, Wind and Fire to James Brown, Aretha Franklin, the artist formerly known as Prince and The Funky Meters. Doors open at 4 p.m., and the music starts at 9:30, with drink specials, costume contest and midnight drawing for two snowboards. Call (970) 468-2788 for more information. Alma’s Only Bar will host its annual Halloween Bash on Friday, Oct. 31, with local band Split Window. The band formed in March 2013 when Julian Daknis and Jodi Messa started combining vocals. Split Window plays a number of original pieces by Daknis, as well as various covers. While having a large focus on reggae, they play a variety of music including blues, pop and classic rock with an upbeat flair and a fun and interactive stage presence. There will be a costume contest, with $100 awarded for first place, $50 for second, $25 for third and an AOB gift certificate for honorable mention. The free party starts at 9 p.m. Call (719) 836-2214 for more information. Led Zeppelin tribute band Honey Puddle will take the stage at the Snake River Saloon in Keystone on Saturday, Nov. 1. Honey Puddle is a cultivated group of musicians that have come together from all sides of the country to reside in Denver and bring smiles to older, die-hard Zeppelin fans, while also creating a fresh buzz amongst the new generation of younger live music fans around the state of Colorado. From unpredictable stage antics to crowd participating Theremin solos, “HoneyPuddle is focused on creating the powerful live show that Zeppelin was notably acclaimed for, while producing the different layers of their studio efforts on a live stage,” guitarist Jeph Kennedy said. Doors open at 4 p.m., and the music starts at 9:30. Call (970) 468-2788 for more information. The Barkley Ballroom in Frisco welcomes the Steamboat Bandits on Wednesday, Nov. 1, for its Bluegrass Wednesday series. This high-energy, up-tempo bluegrass band plays popular bluegrass standards and great original material. The Steamboat Bandits consist of mandolin, banjo, acoustic guitar, electric guitar/slide and bass. Doors open at 9 p.m. for the free show. Visit http://www.barkleyballroom.com for more information. Thursday, Nov. 6, is open mic night with Arnie J. Green at the Dillon Dam Brewery. Experienced local musicians age 21 and older are invited to stop by and session with Green, playing funk, rock, R&B and other creative tunes. The jam starts at 9:30 p.m., and there’s no cover. Visit http://www.dambrewery.com for more information.